iBird United Kingdom and Ireland Pro, the world’s most popular identification app to birds of the UK, is now available as Version 10.06. iBird UK Pro now offers two powerful features: Birds Around Me (BAM) and Percevia™ smart search. Smart search lets you identify birds just like the experts while BAM only shows species that are found in your GPS area. We’ve also added our new Time of Day search feature which lets you filter birds by activity intervals during day or night (Cathemeral), dawn and dusk (Crepuscular), during the day (Diurnal) or during the night (Nocturnal). Whether you are an experienced birder or a beginner at birding, iBird UK Pro contains more birds than any UK app, including 343 common and rare species designated by the British Trust for Ornithology (BTO). With the iBird UK Pro’s avian matching system you can search for birds by color, location, shape, habitat or any one of our 38 identification field marks to find your bird. iBird's comprehensive species pages have 1,200 built-in bird songs, 1,500 professional high resolution bird photographs, 900 hand drawn composite illustrations and over 350 range maps. Version 10.06 of iBird UK Pro Guide to Birds now includes iCloud for backing up and sharing your own photos, notes and favorites among all your devices and a migration feature for moving from Dropbox to iCloud. Whether you are an experienced birder or a beginner, iBird UK is the most authoritative guide to UK Birds you’ll need. ● iPhone X and retina-mode compatibility. 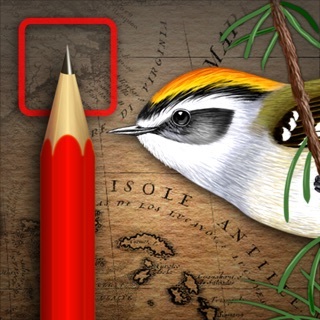 ● Birds Around Me and Percevia smart search now available as in-app purchases. ● iBird now takes advantage of the high-resolution retina displays of the iPhone and iPad so the screen shows more information than ever. ● Contains the latest 2017 BTO checklist. ● View all birds by head which makes identification easier. ● Back up and sync favorites and notes with iCloud and share with all your devices and your friends. ● Fun new birder’s “stickers” to spruce up your text in Messages. ● The ‘Birds Around Me’ narrows the search list to just those birds centred on your GPS location, within a specified radius and a specific season. ● The patented Percevia™ intelligent search prevents you from making the wrong choice when searching for your bird. ● The only birding app that includes both Illustrations and Photos. ● Spectrographic audio display brings insight to the structure of bird songs by allowing you to view the sound's frequency components. ● Every species is shown perched and in flight and most show major seasonal, age and male/female variations. ● Identify 343 species of both native and rare birds. ● Save multiple personal species lists and your sightings in Notes which can be backed up and synced in iCloud. ● Hundreds of carefully selected and edited sound recordings from the Xeno-Canto Community of bird song recordists. ● Filter birds by countries, regions and coasts, so that you see only the species likely to occur in your location. ● iBird’s icon-driven visual search engine, with 35 attributes, enables you to identify birds using shape, colour, location, habitat, head pattern, flight pattern, bill shape, length and much more. ● Search by common name, Latin name and the BTO 5 band code. ● Comprehensive seasonal and migratory range maps include subspecies. Besides compatibility with the iPhone X, this new version of iBird UK has Time of Day, Birds Around Me (BAM) and Percevia smart search features. The new Time of Day search feature lets you filter birds by activity intervals during day or night (Cathemeral), dawn and dusk (Crepuscular), during the day (Diurnal) or during the night (Nocturnal). Time of Day Notes which provide additional information about a species behavior are found on each species from a new Time of Day menu. The Time of Day feature is particularly useful for birders who are interested in night birding. Now you can search on the Abundance attribute which includes: Accidental, Casual, Common, Rare and Uncommon status. Very frustrating that it does not link to your lists and you have to enter every name as a “custom”. There is little online help with issues. Good for bird ID. Great app for bird ID. This app is terrific, and has new features that I hope will be coming to the North American apps soon. The sound quality is amazing, and is enhanced by the amplitude and spectrograms for each sound. Most birds have multiple recordings with well-written descriptions. I really enjoy the photo slideshow, which you can set up to view by photographer, species, or family. Having the sound recordings play at the same time has really helped me identify calls. I was also impressed by the artwork and the high quality of photographs. The search engine is easy to use and quickly lets me identify birds, I love that I can take this anywhere and not need an internet connection for this app to work. I have 2 other UK bird apps, and this is by far the best. It is the most comprehensive, has the most photos and sounds, and is a pleasure to use. I 100% recommend this bird app. Its very rare for a reviewer to uncover all the best features of iBird but you did it. We sincerely thank you for such a summary, you found every feature that sets the app apart from the others in the store.